Dr Robert Dew is a world class presenter who truly knows how to excite his audience. He is regularly described as ‘thought provoking’, ‘entertaining’, and ‘intensely motivational’. As an innovation management consultant he has worked for some of Asia and Australia’s largest companies (both public and private), as well as starting his own new ventures. Since 2000 he has been involved as a founder or investor in 34 different businesses across a range of industries including automotive, education, retail, child care, fashion and distribution and invested in 4 other private firms. His unique combination of practical experience in large firms, entrepreneurial management in private firms and academic research makes him ideally qualified to help companies discover solutions for their innovation challenges. 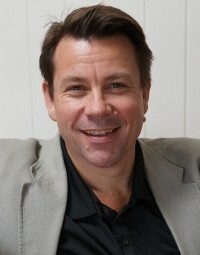 Rob is renowned for challenging and inspiring his audience to think differently. It is hard to walk away from him without a new frame of mind. Founded Safe Places for Children, exiting in 2009 (grew to $24M in revenues in just 4 years). Co-author on three innovation patents (voice data logging, automotive electronics and location based experiential education). Founder Enterprise Workshop (not-for-profit) currently Executive Director responsible for courseware and delivery oversight. Senior Consultant Strativity Group responsible for research and development of customer experience (CX) innovations for companies including Janssen, Metro Melbourne Trains, Supercheap Auto, CBUS, Colonial First State and Australia Post. Former Advisory Chair of the International Society for Innovation Managers and still a member of the Scientific Panel.